Unfortunately the "PointClub Paid Surveys" offer is no longer available. PointClub rewards you with points that can be used to redeem for cash or gift cards. 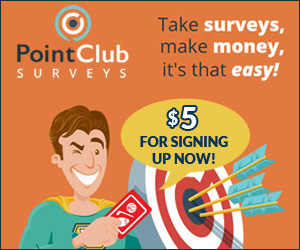 Right now, they are offering new users a $5 sign up bonus, awarded as PointClub points. Just register today and start earning gift cards from top retailers like Amazon, Walmart, Paypal, Xbox, Whole Foods and many more!